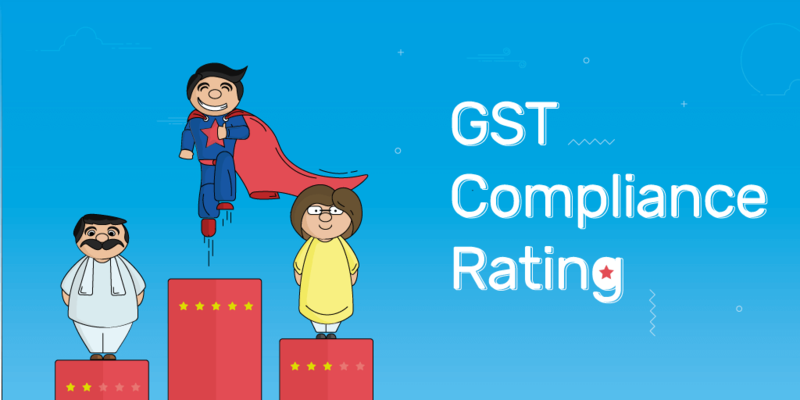 The GST compliance rating is a score given by the government to a business so that other businesses can see how compliant they are with the tax department. This score will be calculated based on parameters such as timely filing of monthly and annual returns, furnishing details of input credits used, taxes paid, etc. These scores will be updated at periodic intervals, and their details will be published in a public domain that all businesses can access. This will allow small businesses to choose the most GST-compliant vendor for their business endeavors. Why do people need to stay GST compliant and receive a high rating? According to the GST law, if buyers wish to claim input credit for the goods they purchased, they will have to mention all the transactions in which they paid GST to their vendors. Let’s imagine a best-case scenario in which buyer A procures products from vendor B and uploads all the sales transactions onto the GSTR-1. Now, all the transactions in the buyer’s GSTR-2 will be auto-populated using the GSTR-1 filed by the vendor. The buyer can then use GSTR-2 to claim input tax credit. Now let’s consider what would happen if vendor B was not paying his dues. In this case, his tax return would not be considered a valid one by the GST department (according to Section 27(3)). This would mean that the buyer then could not validate his GSTR-2, and therefore, he wouldn’t be able to claim input tax credit. If this same vendor is supplying goods to a hundred buyers, then none of the buyers would be able to claim their input tax credit because of the vendor’s failure to pay his dues. This may just be an example, but the point still stands: it only takes the non-compliance of one business to affect–and disrupt–an entire supply chain. With the GST-compliance rating in place, buyers will be able to see which vendors have the best track record of paying their dues on time, and they’ll be able to choose a more compliant vendor right at the beginning so that they don’t have to suffer the consequences of vendor negligence later. The higher a vendor’s compliance score, the better the buyer’s chances to claim input tax credit. If you’re a business owner, you may be asking yourself: “What benefit will I get if I’m compliant with the tax department?” The answer is trust. When your business has a better compliance score, you not only have a better chance of earning the government’s trust, but you also are more likely to earn the trust of clients you could be doing business with in the future. This may seem like a small step in the beginning, but consider the impact that thousands of businesses can have on the GST network if they all collectively work towards GST compliance. If individual business owners work to follow tax laws, then they will help the entire GST ecosystem to stay compliant. As a business owner, it’s important that you understand the significance of being GST compliant, but that alone is not enough; you also need to know what it takes to be compliant in the first place. Businesses should include all their outward and inward supply transactions on their monthly GSTR-1 and GSTR-2. They should file their GSTR-1 and GSTR-2 for a particular month by the 10th and 15th respectively of the following month. Before filing their next tax returns, businesses should first ensure that they’ve paid all their tax dues. According to section 27(3) of the GST legislation, filing a GST return with existing tax dues would make the next return invalid. This would reduce a company’s compliance rating score and could even trigger a chain reaction along the supply chain, making it difficult for their buyers to claim input tax credit. Apart from filing the GSTR-1 and GSTR-2 on a monthly basis, businesses should also submit a consolidated annual return called the GSTR-9.